In April this year four new Brokk models were released. This marked the company's biggest product launch ever, with innovation matching the power of the new equipment. As a renowned manufacturer of demolition robots, Brokk AB located in Skellefteå, Sweden, is considered to be a major success story, with the relatively newly released Brokk 280 and Brokk 500 being warmly received. Thus it came as a surprise that at Brokk’s international dealer meeting in March this year, Brokk showcased four new robots: Brokk 170, Brokk 200, Brokk 300 and the diesel Brokk 520D. Since 2016, Brokk has experienced a dramatic increase in sales, perhaps the largest ever in the company's history, and by 2018, the goal is to reach a turnover of around SEK 1b. 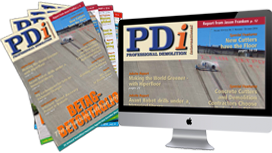 PDi's editor recalls that in the early 1990s, sales levels were around €15M, which was considered very good at that time. The US market grew rapidly and strongly, through the work of its distributor retailer North American Sales, which today is a wholly owned Brokk subsidiary. An important addition to Brokk's sales increase is the acquisition of the company Aquajet Systems in 2017, which has contributed nearly with €9,7M to sales. Aquajet, like Brokk, possesses strong profitability, and had before the acquisition a profit margin of around 10%. Profitability in Brokk has been good to very good since the beginning of the 21st century and has been in the region of 20% and upwards. With these facts in mins, the question arises as what makes the Brokk method of doing things, and now Aquajet Systems products, unique? PDi’s own theory is that the industry's own development combined with Brokk and Aquajet's keen commitment in developing products for multiple applications have gone hand in hand. Perhaps Brokk could have developed even faster in a larger ownership context, but at the same time the question is was the industry mature enough to accommodate this growth? Both Brokk and Aquajet have developed in line with the industry and other players; this is probably an important factor in explaining the company's favourable and profitable development. Now the avowed aim of the combined company is to reach the next level where demolition robot and hydrodemolition technology will be integrated with each other. A good example today is where the Swedish demolition contractor Rivkompaniet uses both Brokk machines and hydrodemolition technology on the renovation of an eight storey building in Sergelhuset, in the middle of Stockholm. "An important part of our success is our relationship with the users of our technology. We do not sell our clients just products without an effective solution that makes them more efficient and profitable in their work, "says Brokk chief executive Martin Krupicka. Here, Martin refers to a concept that was launched in 2016, which might not have been required earlier, namely Brokk SmartPower. Although the building and construction sectors dominate in terms of sales for Brokk, the company is involved in other areas. “Brokk is the optimal demolition solution not only in the construction sector, but within a number of other sectors such as the process industry, cement, nuclear power, tunnelling and mining. The SmartPower concept aims deliver the optimum machine solution to all of these sectors, with the focus being that the machine will last for a long time, and operate as much as possible”, says Martin. Technically, SmartPower incorporates a brand new electric drive line combined with a new monitoring system. It enables Brokk to get much more power in a machine without increasing size. A good example of this is the development of Brokk's machines in the 3t class, where the Brokk 260 has a power output of 22kW; the Brokk 280 with SmartPower has 27kW and the brand new Brokk 300 with the second generation SmartPower, has a full 37kW power output. In addition to the increased power output, SmartPower is the first electrical system developed from scratch in house to cope with the challenging environment of demolition robots that includes vigorous vibrations, dust, etc. By removing 70% of cables and connectors, as well as installing brand new proprietary components, Brokk has significantly increased operational reliability over time. "But, of course, a Brokk can be a hassle too. If a problem occurs, priority number one is to get the machine in place as soon as possible. That is why we have placed great emphasis on both the technical design of the machines and the level of competence of our service technicians globally. I think we have reached so far today with our latest product news and with Brokk SmartPower that we have managed to create a formula for the ultimate machine solution for demolition robots. And we are quite proud of that, "says Martin. If SmartPower is mentioned, then there is a corresponding need to mention SmartDesign and SmartRemote, which are also integral parts of the new Brokk SmartConcept. SmartDesign is based on the fact that the operator can easily maintain the machine daily in as easy a way as possible, without having to lift the hoods for control or lubrication. The entire machine is thus built to be easy to service and maintain continuously in the workplace. SmartRemote is about ergonomics and productivity for the operator. This ergonomic solution is based on Brokk's patent to have the handle around the waist to remove weight from the shoulders and back, as well as the joysticks' design being short enabling the operator to rest the arms on the box. Productivity is thereby optimised by using (more expensive) professional radio communication technology, with the design of the control box meaning that the operator has no need to look down or depend on the screen to operate the Brokk machine. With its four new models, this formula has been further consolidated. Before launching the four new models, it was recognised that there was quite a gap between Brokk 160 and Brokk 280. By launching Brokk 170, which will phase out Brokk 160, as well as the launch of Brokk 200, the gap has been filled. This however was not considered to be sufficient. The Brokk 300 has also been launched, which will eventually phase out the relatively new Brokk 280. Additionally, a diesel variant of Brokk 500, called the Brokk 520D, has also been launched. The launch of the new equipment is Brokk's largest ever, and the new models can easily be categorised as Brokk 170 being the lightweight and strong model, while the Brokk 200 is powerful and flexible. Brokk 300 is the versatile and ‘top returning’, whereas the Brokk 520D is really a heavy model that can handle any tough environment where there is no electricity available. The Brokk 170, weighing 1.6t, takes the best attributes from the Brokk 160, and also possesses the complete Brokk SmartConcept™ installed with the power of SmartPower, the reliability of SmartDesign, ergonomics and productivity of SmartRemote. This is said to make the Brokk 170 the ultimate tool for the construction industry. With 24kW SmartPower electronics, this lightweight machine produces 15% more power than its predecessor. It produces impressive impact through the new hydraulic breaker, Brokk BHB 205, and brutal power with the new concrete crusher Darda CC440. It has nevertheless retained the same compact physical dimensions as the Brokk 160, and many tools are suitable for both models. The new Brokk 200 opens up a new weight class for demolition robots that fills the gap between the Brokk 170 and the Brokk 300. Brokk technology has enabled the placing of the power of the 3100kg Brokk 280 compressed into a handy package of just 2100 kg. The 27.5kW machine is able to carry tools and equipment that is in a weight class higher than its size, with the required hydraulic power. Unlike Brokk 170, Brokk 200 is equipped with the new breaker Brokk BHB 305, which delivers 40% greater impact and the new, powerful CC480 Darda concrete crusher. Furthermore the Brokk 200 has 15% longer vertical and horizontal reach, despite possessing virtually the same compact dimensions as the Brokk 160. The extra chassis length and machine weight ensure outstanding balance even when handling the heavier and more powerful tools. All in all, the Brokk 200 sets a new standard for compact remote controlled power, and is highly suitable for heavy work even in hard to reach locations. The Brokk 300 is a good example of how quickly Brokk's demolition robots are developed to meet the industry's ever more stringent demands. Brokk 300 replaces Brokk 280, and is equipped with the more powerful Brokk BHB 455 breaker that gives 40% greater impact. Equipped with the new generation of Brokk SmartPower technology, the power increases to 37kW, providing the hydraulic flow and pressure required for the machine to efficiently drive its heavier and more powerful tools. The Brokk 300 is slightly longer than the Brokk 280, and weighs 500kg more, but still has the same width and height enabling it to enter the same narrow spaces. A new arm system extends the vertical and horizontal range to 6.5m and 6.1m respectively. "With its power, reach and stability, this model will be highly appreciated in the industry," says Martin Krupicka. Last but not least, Brokk has established a new standard for diesel powered robots with the Brokk 520D. This is also equipped with a larger hydraulic breaker that provides 40% more impact than the model it replaces, the Brokk 400D. The environmentally friendly 5t robot is available with two different diesel engines, either a Step 4 / Tier 4 Final Kohler engine that meet the new emission standards in the EU and in North America, or a Kubota engine for the rest of the world. The new Brokk 520D is a bit heavier and longer than its predecessor, Brokk 400D, with a larger BHB 705 breaker and 250mm longer working range. Due to its robust arm systems and increased hydraulics, the Brokk 520D can use the heavier and more powerful tools already available for Brokk 500 which were released last year. Crowning the machine, the Brokk 520D is equipped with Brokk SmartDesign which facilitates day to day maintenance thereby increasing operating time. 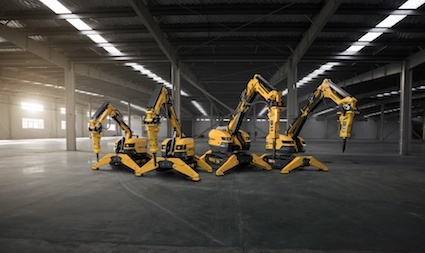 The four new demolition robots reflect Brokk’s unwavering focus on innovation, higher performance and more operating time for its customers all over the world. Each of the new models provides the very latest technology in terms of robust reliability and power to weight ratio. The first of these new machines will be available from June-August 2018. As mentioned, Brokk has not stopped its development, surprising the demolition world during the last decade with its new products being launched, and the last two years has seen this rate of development upped. It will thus be extremely interesting to see how Brokk, now together with Aquajet Systems, can take demolition and hydrodemolition techniques to new levels.